Nintendo just announced a whole bunch of new 3DS bundles for this fall. But they're not New 3DS bundles. They're just new 3DS bundles. Confused yet? Thanks to Nintendo's baffling use of nomenclature, the next few years could be full of mixups like this. 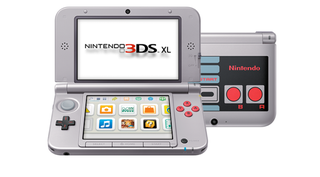 In Japan last month, Nintendo announced the New 3DS, a 3DS upgrade with new guts and a second analog stick. Though it resembles the 3DS we've known and loved for the past few years, this New 3DS is actually a brand new piece of hardware, and it'll even have at least one exclusive (a port of the Wii's Xenoblade Chronicles). The New 3DS won't be out in North America until next year or later, though, which means that any 3DS bundles you might see this fall are not the New 3DS. They're just new 3DSes. So as you go shopping this holiday, remember that even though the 3DS is totally worth buying, a big New upgrade could be imminent.